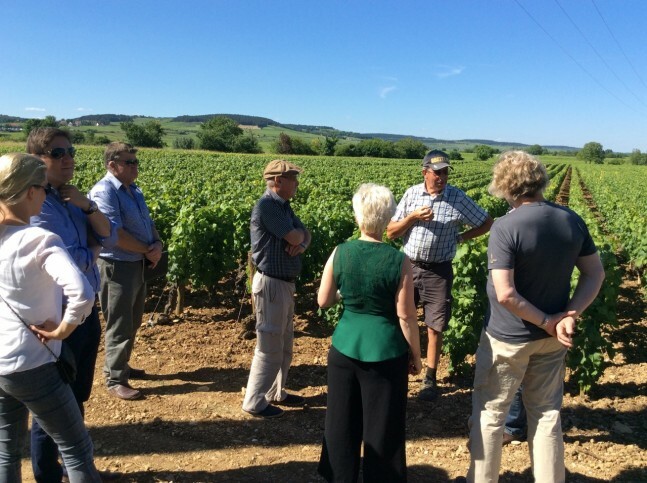 Nigel Greening, proprietor of Felton Road vineyard in Central Otago, New Zealand, vinous oracle, indefatigable gourmand and a true Wandering Palate gives a most fascinating account of ‘wandering’ in Burgundy. We kicked off the week with a dinner with some sommelier friends in Montparnasse. Le Petit Sommelier was an ideal venue, especially as we brought several of our own sommeliers with us (none of them that petit!). If ever a group was over equipped for the task we were it, with Jonathon Bauer: France’s current champion sommelier and Olivier Poussier: a former champion among our ranks, we had the perfect team to decode the big list and they set to it with enthusiasm. Any of us could have picked out solid bottles from the usual suspects, but these guys were a whole different game: we started with what tasted like white Burgundy, but turned out to be a Rabigato: Muxagat from the Douro (Mateus Nicolau de Almeida). From there to Corsica for Y Leccia Patrimonio Blanc 2012 from Domaine d’E Croce: a gorgeous rich and fruity Vermentino white, perfect for the boudin noir we ate with it. A St Joseph from Gonon wrapped up the whites; Marsanne dominant and lusciously hedonistic. The message of the evening was how many amazing wines are completely affordable when you have the right guide to take you there. We all need a personal sommelier for such evenings (plus a list good enough to make the hunt possible). But it’s not often one arrives so well armed! Tuesday started with a brief tasting for some local Paris somms, all up to speed in their knowledge and enthusiasm, before a quick lunch at Le Sens Unique just off the Champs Elysee; great rognons de veau and confit de canard washed down with Provence Rosé. The 13’s were chiselled, honed to a micron of accuracy. This a domaine which has always enjoyed precision, but the wines are now enjoying a new height in this regard. It was evident that they are taking no chances with oxidation issues, with sulphur showing on a few of the wines. They are now also a few years into a biodynamic regime and clearly enjoying the results of it. These are wines that celebrate the skill of the careful winemaker. There could not have been a finer contrast to enjoy before the final tasting of the day: for we had the Willy Wonker magic ticket of the Côte de Beaune: Coche-Dury. I had tasted the wines a few times, but never the top cuvées and I have never met the man. These wines seem to have almost a mythical status; the white analogue to Domaine Leroy. From my previous experience I had seen some uncanny parallels; both seem to conjure a special power and gravitas from minor appellations, both seem to be viticulture driven, not winery driven… both are very reluctant to open their door… and, of course, both attract market prices normally ascribed to national budgets. And the wines? Ahhh, yes. No chiselling here, no honing, no striving for perfection. These are wines of natural, organic power (I’m not saying the wines are natural or organic, I’m using the words in their true sense), they are like living things, wines of terroir, but not anybody else’s terroir, these are Jean-François’ personal patches of vines and they taste that way. The legendary Corton Charlemagne soared on a carpet of toasted almonds. Of course, not worth a fraction of the ludicrous prices the secondary market elevate it to, but worth every penny of the rather more modest prices the winery charge to the privileged few who get an allocation (somebody told me there are just 10 people on the private customer allocation list). I feel the deepest sympathy for people like Jean-François: catapulted into a prominence they didn’t seek and their labours turned into a set of bragging rights for billionaires. There are worse problems, to be sure, but it isn’t a fate that I’d wish on any such person. As lunch comes to an end it becomes clear that we have passed some sort of test and Mounir invites us to come back to the winery to discuss white wine making. And so we spend a happy afternoon delving into barrels (this man has well over 80 cuvees in any vintage) and discussing finer points of white wine-making, nerdy beyond belief to anybody other than those who earn their living this way. We look at an amphora filled with Corton Charlemagne berries and left on skins with no treatment at all for the last nine months. The cap has just started to fall and the liquid is fabulous: deeply phenolic, like no Corton you could ever find in a bottle, but a completely engrossing, complex wine that is probably far closer to the wines made by the original Cistercians than anything in any Burgundy cellar today. Inspiring stuff. I am struck by the extra-ordinary generosity of so many of our hosts. Mounir could have bought a car with the proceeds of the bottles he pulled, and a decent car at that. This wasn’t to sell wine, or to curry the favour of critics. This was plain enthusiasm to share his world with his peers. It’s humbling. The following morning I had to leave very early, but Bernard was up to give me freshly baked bread and croissants, home-made jams and local butter. We drank coffee and chatted before I had to go find my hire car. I never met him again. His rise to 3 star prominence and his tragic suicide became one of the road legends of haut cuisine. Amazingly, his widow: Dominique, picked up the baton and ensured that his vision continued. When we arrived she was waiting for us.